Weber Smoky Brown Sugar Rub will add a deep, rich flavor with smoky notes and sweet brown sugar. 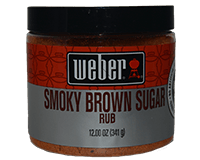 Weber Smokey Brown Sugar Rub is great on pork, chicken, and salmon. Sprinkle some Weber Smoky Brown Sugar Rub on your corn on the cob to add a smoky flavor. Rub approximately 2 tablespoons of Weber Smoky Brown Sugar Rub per pound of pork, chcken, and salmon. Make sure to wait approximately 5 mins after putting rub on before cooking. No MSG Added. No Artificial Flavors. No Artificial Preservatives. Gluten-Free. Ingredients: Salt, Brown Sugar, Sugar, Garlic, Maltodextrin, Onion, Paprika, Soy Sauce (Soybeans, Salt, Vinegar), Spices, Rice Concentrate, Natural Smoke Flavor, Natural Flavor, Butter (Cream, Salt), Buttermilk, Gum Acacia. Contains Soy and Milk.